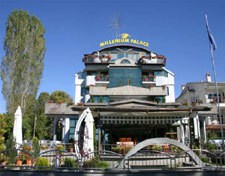 Hotel Millenium Palace Ohrid is an oasis of luxury and tranquillity with extensive top-class facilities. The city of Ohrid is considered Europe's Jerusalem, which means that guests can enjoy the advantages of a modern city with a glorious past and a rich culture in a truly idyllic setting. The hotel is just a short, pleasant walk from the old town, where one can discover ancient monuments and exciting nightlife. Guests can enjoy the breathtaking view of the lake, especially at sunset. Located just 20 minutes away from the international airport at Ohrid, this resort is accessible from any city in the world.